Court jails one of Chibok girls’ abductor 15 years – Royal Times of Nigeria. The Federal High Court sitting in Wawa Cantonment, Kainji, Niger State, on Monday sentenced Haruna Yahaya to 15 years imprisonment for terrorism offences. Haruna Yahaya, 35-year-old, crippled on the left arm and left leg was convicted for being a member of the proscribed Boko Haram terrorist group and participating in the abduction of over 200 schoolgirls in Chibok, Borno State, in 2014. 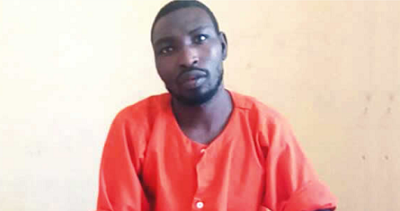 He was said to have participated in Boko Haram’s attacks in Chibok, Chibok Local Government Area of Borno State and Gabsuri town in the Damboa Local Government Area of the state. Yahaya had on Monday pleaded guilty to the two counts preferred against him by the Federal Government, but pleaded for mercy, saying he was forcefully conscripted into the terrorist group. Delivering judgment, the judge said the court was not fooled by Yahaya’s story. The court noted that the convict was using the misfortune of his handicap to draw sympathy, adding that everybody has a choice. The judge thereafter sentenced the convict who had been in detention since 2015 to 15 years imprisonment. The court ordered that the sentence would commence counting from Monday.